Proliferation assays provide quantitative evaluation of a cell population’s viability and growth, and are a crucial aspect of cancer biology research. There are various types of proliferation assays, the principal differences being what is actually measured and whether it is an endpoint or kinetic assay. Endpoint assays for measuring proliferation, including those based on cellular metabolism and DNA synthesis, require separate experiments for each time point and are difficult to normalize across conditions. Additionally, these indirect metrics necessitate the collection and processing of cells with potentially expensive reagents and complicated protocols that can lead to artifacts and misleading results. Kinetic proliferation assays deliver a more accurate and complete profile of proliferation rates over time, providing an attractive alternative to endpoint assays. Recent advances in automated microscopy and image-analysis tools have enabled researchers to conduct imaging-based kinetic proliferation assays for detailed characterization of cell culture viability and growth over time periods spanning days to weeks. With this approach, quantification of cell-population size is generally determined using either percent-confluence measurements or cell counts. Although percent confluence provides some insight into the relative size of a population, the relationship between cell confluence and number of cells present is not linear at many culture densities. Therefore, a kinetic proliferation assay that directly determines cell count is preferable to confluence measurements for many applications. However, conventional methods for counting cells rely on nuclear labels that come with considerable limitations. Intercalating dyes, such as DAPI and Hoechst, are not suitable for conducting kinetic live-cell assays because of induced toxicity. Expressed fluorescent nuclear labels, such as H2B–GFP, are also potentially disruptive to cells and require considerable time and expense to establish and maintain stable cell lines. The Lionheart FX Automated Microscope and Cytation Cell Imaging Readers from BioTek Instruments are fully automated imaging systems optimized to perform a broad range of live-cell applications. Both instruments are available with high-contrast brightfield—an imaging technique that generates enhanced image quality and contrast over conventional brightfield for improved quantitative analysis. High Contrast (HC) Cell Counting uses a modified form of high-contrast brightfield to determine accurate label-free cell counts for normalization of experimental data and kinetic proliferation assays. In HC Cell Counting mode, refraction of white light by each cell produces a distinct bright spot against a dark background. Gen5 Microplate Reader and Imager Software readily identifies each object to generate HC cell counts that are comparable to counts achieved using nuclear labels, across a wide range of cell densities (Figure 1). Combining this powerful label-free cell counting technique with the temperature, humidity, and CO2 controls available on the Lionheart FX and Cytation systems enables uncompromising long-term kinetic proliferation studies. Additionally, coupling the Cytation with the BioSpa 8 Automated Incubator provides a fully automated system for conducting proliferation studies on up to eight cell culture plates at a time. Figure 1. HC Cell Counting produces accurate cell counts without the use of fluorescent labels. (A) High-contrast brightfield image of NIH3T3 cells. (B) HC Cell Counting mode generates images in which each cell produces a distinct bright spot against a dark background. (C) Gen5 image analysis software identifies each bright spot to generate HC cell counts. (D) HC cell counts are comparable to those achieved using fluorescently labeled nuclei across a range of cell densities. The HC Cell Counting kinetic proliferation assay enables quantitative evaluation of cell-division rates for normal and malignant cell types, as well as measuring effects of antiproliferative treatments (Figure 2). For many cell types, a proliferation assay lasting three to five days is sufficient for capturing multiple population doublings and generating meaningful data. Initial cell densities should take into account cell-doubling time and duration of experiment. A four-day experiment with 2,000 cells seeded per well in a 96-well microplate is a good starting point for cell lines with a doubling time of around 24 hours. These parameters result in robust counts while establishing a low enough cell density that the culture will not become fully confluent until well into the experiment. Environmental conditions, including temperature (37oC), gas (5% CO2), and humidity (90%) are maintained throughout the assay. During the automated protocol, two images are collected for each well every two hours—one high-contrast brightfield image for reference and qualitative evaluation, and one HC Cell Count image. Gen5 image processing and analysis is done in real time while the assay is running. Although image-analysis settings have been optimized for a variety of cell types, all settings should be determined empirically by visually confirming accurate placement of object masks using a few representative images. If modifications to the image-analysis settings are required, adjustments to the threshold value and object size should be sufficient to address most conditional variations. Once settings are confirmed, the protocol can be saved for future use with the same or similar cell types. Figure 2. NIH 3T3, HeLa, and HCT116 kinetic cell proliferation profiles generated from HC cell counts enable quantitative analysis of doubling times and response to drug treatment. Cell counts per mm2 were determined every two hours over a five-day period or until cells reached full confluence. 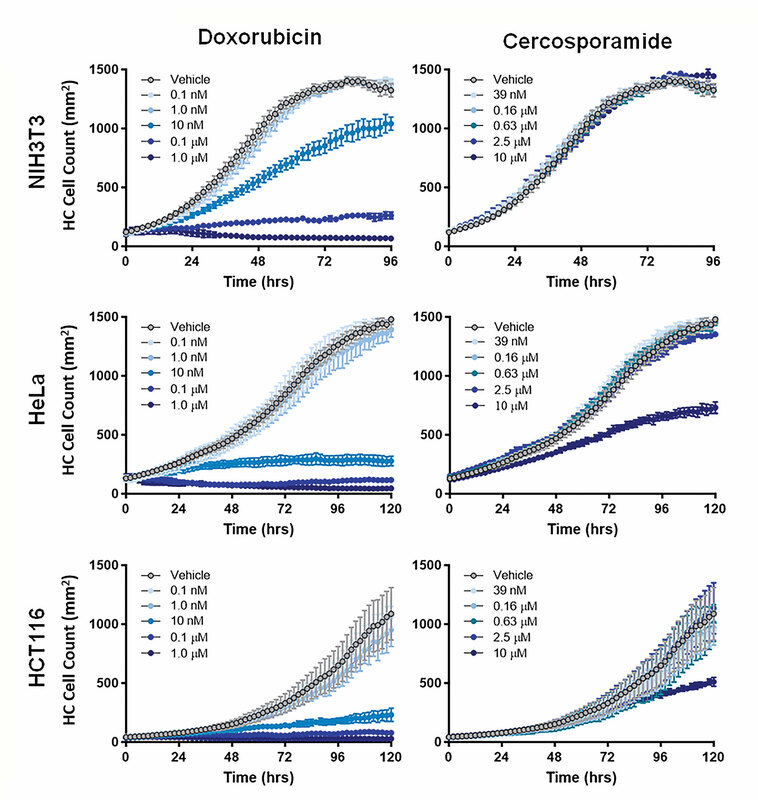 Profiles from five concentrations of doxorubicin and cercosporamide demonstrate a cell-type-dependent differential-dose response. Calculating IC50 values are a useful metric for quantifying dose response. However, values based on a single endpoint can yield incomplete and misleading results. Kinetic proliferation assays provide a detailed profile of the effect of drug treatment, enabling researchers to evaluate treatment response over time and determine the optimal time course for analysis. Using the area under the curve (AUC) from each proliferation profile accounts for dynamic drug-treatment effects, resulting in a more relevant evaluation of dose response and drug kinetics (Figure 3A). An additional advantage of this imaging-based kinetic assay is the detailed visual record of cell health and morphology that is available for deeper analysis. This information can provide valuable mechanistic insight into cellular responses and reveal more subtle drug-treatment effects (Figure 3B). HC Cell Counting provides an accurate and convenient method to quantify the size of a cell population without the need for fluorescent labels. Using this technique to conduct kinetic cell proliferation assays on the Lionheart FX and Cytation BioSpa system enables long-term, detailed evaluation of cell-population viability and growth. Figure 3. Unique quantitative and qualitative analysis of drug-treatment response using kinetic proliferation data. (A) Area under the curve (AUC) of cell count per mm2 were used to calculate IC50 values for NIH 3T3, HeLa, and HCT116. (B) Qualitative analysis of kinetic cell proliferation provides valuable insight into phenotypic response to drug treatment. NIH 3T3 proliferation images 36 hours after treatment with indicated concentration of doxorubicin. With 10 nM doxorubicin, cell division is inhibited without causing overt cytotoxicity; while at 100 nM and higher concentrations, signs of cytotoxicity are clearly evident.